Tap the presentation you want to work on in the Keynote opening screen. Tap the slide that will come before the transition. Tap the Tools button, and then tap Transitions and Builds. The effects and options list opens. Tap the Effects tab at the top, and then tap the type of transition you want. Magic Move moves an object from a location on one slide to a location on the next slide. Follow the onscreen instructions to create this effect. Tap the Options tab, and then scroll through the tools to set the duration, direction, and delay of the transition and when you want it to begin. Tap Play to see a preview, and then tap Done. To create an animation, tap an object or element of the slide. Tap the plus sign to add the first part, the build in, of the animation. A list of possibilities opens. 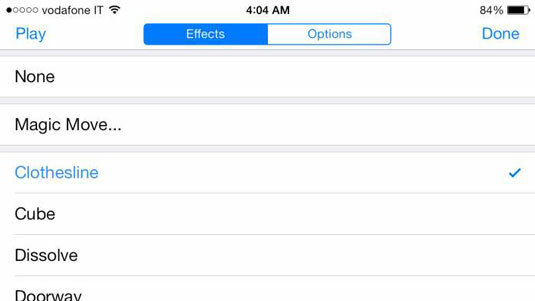 Tap the Effects and Options tabs to choose the type of animated effect you want. Repeat Step 8 for the second, build out, part of the animation. Tap the Order tab to rearrange the order in which the animated effects occur. Tap an object or element, and then tap the Format button (the paintbrush) to see the editing options available for that object.